Ask a local what people do in Wallace at night and you’ll likely get a laugh, a smile, or some variant of what is apparently a standard answer. “Drink,” says 16-year-old Randy Towne, a waiter at the 1313 Club, a popular pub on Bank Street. Towne, who attends Wallace High School, has lived in this tiny historic burg since he was 2. People his age, he says, tend to party at home, in garages, cursing their rivals at nearby Kellogg High School. Bartender Liz Lane, 22, adds that most people her age already have kids, but the rest go out to the few little bars along Bank and Cedar streets and toss them back. 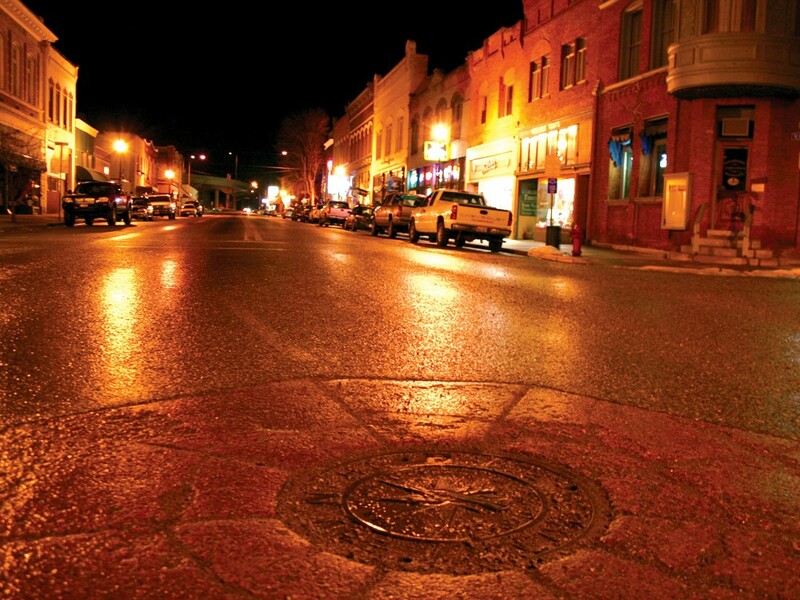 Wallace, Idaho, isn’t a nightlife destination, exactly, but it’s worth an overnight trip (especially in the summer, when festivals are common). The town is small enough that you can sample all its offerings in one go, and by the end of the night you almost feel like a local. We recommend starting with dinner on Bank Street, either at the Smoke House (see box, below) or the 1313 Club (608 Bank St.), a huge, high-ceilinged public house festooned with animal heads and mining memorabilia. The pub grub here is solid, and they serve ales and lagers from the brewery next door. Spend the rest of the night on what one local called “the other side of town,” which is just a block away. Late-night revelers bounce back and forth between two mining-themed bars here, the Day Rock and the relatively new Metals Bar (514 Cedar St.). The latter, done up in black and blood red, is surprisingly hip for historic Wallace, but it’s not ironic. It reeks of smoke, and one entire wall is lined with photographs of miners, only some of which are of the sepia mustache era — the rest are flash-bright modern snaps, images of the guys who are toiling underground today. Here, one can play horses for jukebox cash with the bar’s manager, 27-year-old Josh Maravilla, a miner himself, and scoop up a handful of their “world famous” dill pickle pretzels. Maravilla, though he looks imposing, is a welcoming guy. He loves his hometown, and he treats his customers almost like family — even an older woman who, on our visit, spent the night falling off her barstool and emitting ear-piercing whistles in his direction. “I’m kind of living the life right now,” Maravilla says with a smile. Across the street at The Day Rock (515 Cedar St.), they sing karaoke versions of “Bohemian Rhapsody” late into the night. The place is reminiscent of Spokane’s Swamp Tavern — drop ceilings, bad carpet, but charming. We fell into a couple of games of pool here with the first guy who didn’t laugh when told we were writing a story about nightlife in Wallace. Josh (we stopped taking notes on last names a couple of Buds back) isn’t a local, but he’s treated like one. He was in town on one of his many trips driving megaloads from Oregon up to Alberta for the massive Imperial Oil project. He was stranded here for a week about a month ago, and now everybody knows his name. Cruising the main drag, you can’t miss the giant smoker sitting outside the Smoke House (424 Sixth St.). This former cigar store serves tasty beef brisket, pulled pork, andouille sausage and more. Plus, the backs of the bathroom doors are plastered with Far Side cartoons, and they’ve got a fat tabby named Choo-Choo, who has a penchant for stealing umbrellas from unsuspecting patrons. Before leaving town, consider a breakfast burrito at the Red Light Garage (302 Fifth St.), a wild kind of knick-knack museum/diner run by Jamie and Barbara Baker, who are also turning an old bus across the street into a drive-thru. Jamie will inundate you with Wallace trivia if you let him, and he’ll plug a quarter into the brothel-era player piano if you’re nice. The city’s unofficial motto today might be “hunt, mine, drink” (see above), but it used to be more like “gambling, whoring, and drinking,” according to an ambulance driver and part-time gold prospector who was celebrating his birthday at the Metals Bar last week. You can get a taste of Wallace’s colorful history at the Oasis Bordello Museum (605 Cedar St.), but call ahead — it’s closed for winter, and the hours can be funny even in summer.